Waveshaping is the process of altering the shape of a waveform in some prescribed manner to produce a new waveform having a desired shape. Examples include altering a triangular wave to produce a square wave, and vice versa, altering a square wave to produce a series of narrow pulses, altering a square or triangular wave to produce a sine wave. and altering a sine wave to produce a square wave. is a positive de level. Positive area accumulates under the input waveform as time passes, and the output rises, as shown in Figure 14-32. If the de level is suddenly made negative, and remains negative for an interval of time, then negative area accumulates, so the net area decreases and the output voltage begins to fall. At the point in time where the total accumulated negative area equals the previously accumulated positive area, the output reaches. positive and negative levels, the output rises and falls in synchronism. Note, that the slope of the output alternates between +E and – E volts/second.How a triangular wave is generated using a practical integrator. Figure 14- 33(b) shows the actual waveform generated. 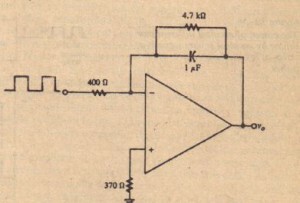 Notice that the figure reflects the phase inversion caused by the amplifier in that the output decreases when the input is positive and increases when the input is negative. The average level (de component) of the output is 0, assuming no input offset. Note also that the slopes of the triangular wave are ±EIRIC volts/second, since the integrator gain is lIR1C. It is important to be able to predict these slopes to ensure !hat they will he within the specified slew rate of the amplifier. In the figure, T represents the period of the square wave, and it can be seen that the peak value of the triangular wave is Equation 14-65 shows that the amplitude of the triangular wave decreases with increasing frequency, since the period T decreases with frequency. On the other hand, the slopes aVlat are (contrary to expectation) independent of frequency. 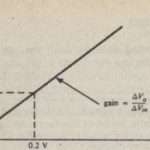 This observation is explained by the fact that while an increase in frequency reduces the time at over which the voltage changes, it also reduces the total change in voltage. a V. The phenomenon is illustrated. 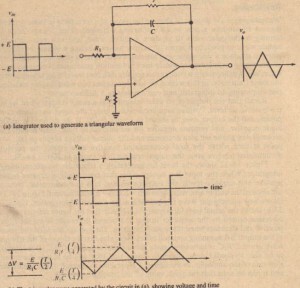 The integrator in Figure 14-35 is to be used to generate a triangular waveform from a 5OO-Hzsquare wave connected to its input. Suppose the square wave alternates between :t12 V.
1. 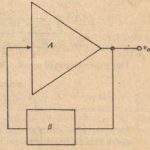 What minimum slew rate should the amplifier have? 2. 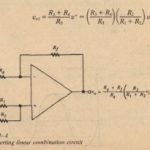 What maximum output voltage jshould the amplifier be capable of developing? If it were possible to generate an ideal square wave, it would have zero rise and fall times and would therefore change at an infinite rate every time it switched from one level to the other. 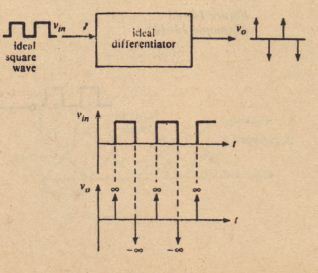 If this square wave were the input to an ideal differentiator, the output would be a series of extremely narrow (actually, zero-width) pulses with infinite heights, alternately positive and negative, as illustrated in Figure 14-36. These fictional, zero-width. infinite-height “spikes” arc called impulses. They have zero width because each change in the square wave occurs in zero time. and they have infinite height because the rate of ch~J\P,eof the square wave is·infinite at the points where changes occur. The negative impulses correspond to the negative rates of change when the square wave goes from a positive value to a negative value. Between the time points where the square wave changes, the rate of change is 0 and so is the output of the differentiator. a somewhat idealized square wave in which the nonzero rise and fall times arc represented by ramps. The output that would result if this square wave were to drive an ideal diffcrentiator is also shown. Finally. the typical output of a practical differentiator is shown. Here, the output pulse is distorted (although still usable in timing circuits), because of the restricted bandw idth of a practical differentiator and because of slew-rate limitations. Notice that de level in the input to a differentiator has no effect on till: output, because tilt! rate of change of a de’ component is o. From a circuit viewpoint. the input capacitor blocks de levels. (The figure docs not show the phase inversion caused by the inverting amplifier.) 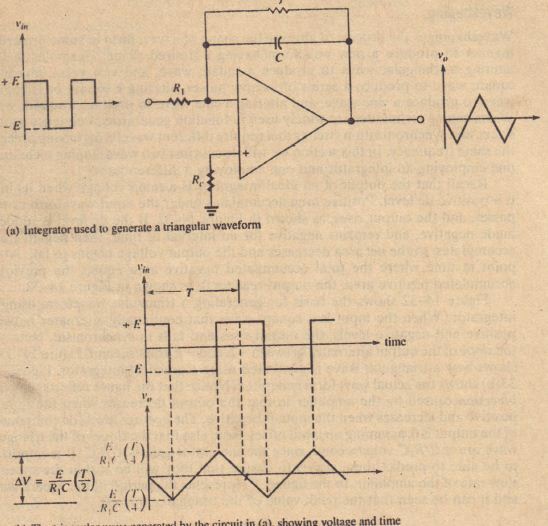 Prom studying the ideal output in Figure 14-37, the reader should be able to deduce that an ideal diffcrcntiator driven by a triangular wave will produce a square wave. Since the output equals the rate of change of the input, the square wave will alternate between :! :(R,C)la volMI volts, where aVj At is the rate of change of the triangular input. 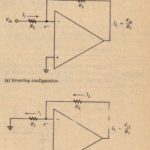 Amplifier slew rate is a serious limitation in these waveshaping applications, because the differentiator output should theoretically have an infinite rate of change whenever the slope of the triangular input changes from positive to negative.